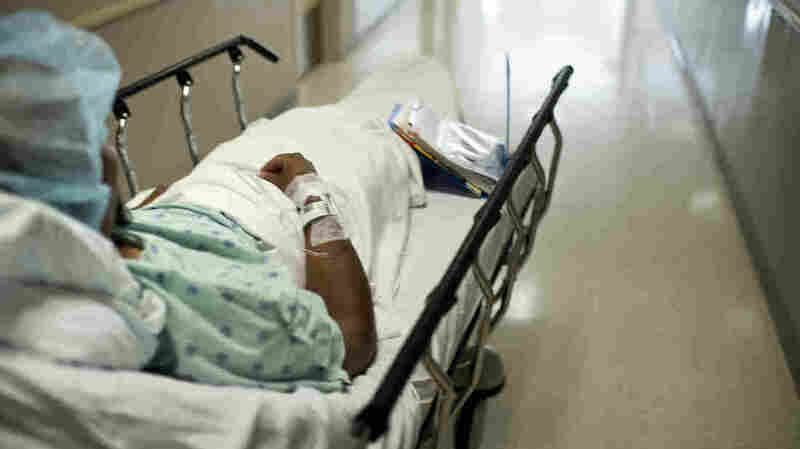 Tax Breaks For Organ Donors Aren't Boosting Transplant Supply : Shots - Health News The tax incentives are intended to defray the organ donor's cost in medical care, travel and lost wages. By federal statute, it's illegal to pay someone for the organ itself. But the modest breaks available in some states haven't made a dent. A kidney donor is wheeled to an operating room for a transplant at Johns Hopkins Hospital in Baltimore in late June. Seventeen states offer tax incentives to people who donate a kidney, a portion of their liver or bone marrow for transplantation. But a study finds these sweeteners aren't working. Researchers looked at what happened in the years before and after these tax incentives were passed and found no increase in organ donation rates. It's the latest contribution to a debate about how to increase the supply of organs for transplantation at a time when more than 100,000 people are on waiting lists and donations have been flat for several years. A recent NPR-Thomson Reuters Health Poll found that 60 percent of Americans support some kind of financial incentive to organ donors that could be applied to health care needs. But the new report raises a caution about how much to expect from financial incentives. "It may be that this particular form of altruistic behavior is unrelated to finances," Dr. Atheendar Venkataramani and his colleagues write in this month's American Journal of Transplantation. "Individuals who want to donate will commit to that regardless of cost, especially if they know and care for the recipient." But there may be other reasons why the tax breaks aren't working, they say. For one thing, they may just be too small. Typically states offer a deduction of up to $10,000 from taxable income. For a typical family that translates to less than $1,000 in reduced taxes. But the financial burden for a living kidney donor can range from $907 to $3,089, according to one study. The tax incentives are intended to defray the organ donor's cost in medical care, travel and lost wages. By federal statute, it's illegal to pay someone for the organ itself. Authors of the new study suggest increasing the value of the tax deductions or converting them into a tax credit, which would lower the donor's tax bill on a dollar-for-dollar basis. So far only Iowa offers donors a tax credit. There's also reason to think that few people in states with tax credits know about them. Study authors found that even organ donation advocate groups were unaware. So were people being evaluated as living donors, including even the most educated and informed prospective donors. Maybe states that have enacted organ donor tax incentives were already progressive enough to have done other things to increase donation. So they have tapped out the potential. Finally, maybe it just takes longer for changes in tax law to have an effect. The study looked at donation rates within two years after passage. Whatever the reason, the study authors aren't saying the tax breaks should be abandoned. "These tax incentives cost the states very little, so there is no real reason to do away with them," says Venkataramani, a Massachusetts General Hospital resident who led the study. "Instead we should focus on improving them." The states that offer organ donor tax breaks are Arkansas, Georgia, Idaho, Iowa, Louisiana, Maryland, Massachusetts, Minnesota, Mississippi, New Mexico, North Dakota, Ohio, Oklahoma, South Carolina, Utah, Virginia and Wisconsin.